The IDEAL 4005 is an innovative and high capacity 6mm Strip Cut office shredder, featuring an electronically controlled Safety Protection System. EASY SWITCH is an intelligent control element that indicates the operational status of the shredder with varying colour codes and back-lit symbols. The machine will also cease shredding if the waste bag is full, the door is open, or if the motor has overheated. The IDEAL 4005 will go into energy-saving mode after 1 hour of not being used. Features automatic reverse and power cut-off in case of a paper jam. Also features a photo cell controlled automatic start and stop as well as "ECC" (Electronic Capacity Control) which is an indication of the used sheet capacity during the shredding process. Automatic oil injection on the cutting shafts during shredding operation for constantly high shred performance The 1600 Watt single phase motor offers quiet but powerful shredding for continuous operation. 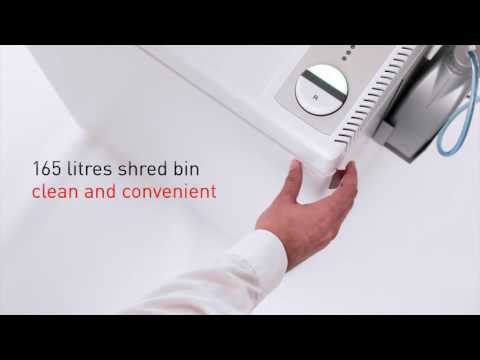 The shredder has a high-quality wooden cabinet with a plastic waste bin and is on casters so it is fully mobile.